you can find her tubes here. psp 9 or any version should work and Animation shop. pick two colors from your tube. style/linear. flood fill layer 1 with your gradient. then add Effects/Plugins Xero/Fritillary with these settings. place where you want it on your tag. keep the gradient the same in the layer palette. down under the first rectangle layer. See my tag for placement. or one of your choice. 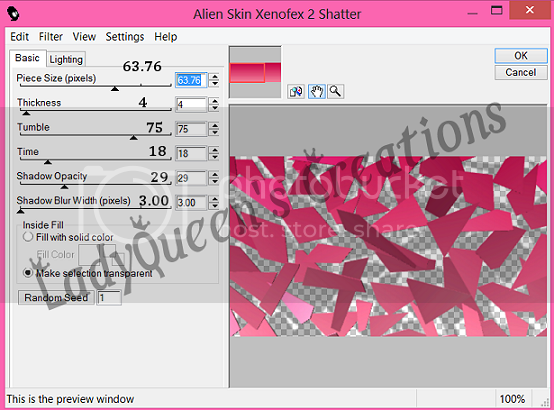 X out your bg layer and your tube layer and merge your 3 rectangle layers together. Selections/Invert , add a new raster layer and flood fill with a color from your tube. Selections/Select None. Bring this layer to the top. go back to your rectangle layer duplicate twice for a total of 3 layers. on the first layer add the xero fritillary with the same settings as before. unless you wait til the end like i do. X out the 2 copies of your rectangle layer right click in the layer palette copy merged. and go over to animation shop. paste as a new layer. merged. go over to animation shop Click inside the first frame paste after current frame. repeat these steps for the last layer in psp and animation shop. view your animation and if your happy you can save your new tag. Here is another example or the tag. merge these two layers together and name it border or something in your layer palette. copy and paste your Canada flag as a new layer and bring under your paper layers. resize by 80%. rename this layer to flag. saying or Proud Canadian like i did, add elements or whatever else you like to your tag. don't forget your cr info on your tag. x out the bg layer ,border and flag layer. merge visible all these layers. a flag layer and a bg Layer. layer twice for a total of 3 layers. you can rename these flag 1, flag 2, flag 3.
click inside the leaf. go to effects eye candy 4000 with these settings. go up to flag 2 and add your swirl filter but this time hit random seed. do the same thing to flag 3. selections/select none. go to your border layer 1 selections/select all selections float/defloat. just hit random seed on each layer. not x'ed out. right click copy merged. go over to animation shop. right click paste as a new layer. go back to animation shop and on the second frame right click ,paste after current frame. view animation and if your happy with your results you can save your tag. the plugin just like you did for the tag. hit yet. on the layer right above (not the group layer) right click merge group. add your elements use the ones i used in my tag if you want to or use your own. see tag for placement. go ahead and add your cr info on the tag make it the top layer. merge all the other layers together. do the same thing for you pink jelly fish. just leave them there for a min. copy and go back to animation shop, right click paste as a new animation. duplicate keep doing this until you have 16 frames of the mask. mouse until you have the jelly fish where you want it on your tag. and let go. copy and go back to animation shop. always go back and redo it. now view animation and if you like what you see then you can save your animation.